Craft your own fizzy, festive sparkling rosé at home with this kit that makes it easy. Summer parties, Sunday brunch, girls' night in: There's hardly a gathering that sparkling wine can't make more festiveespecially when it's pink. Pop open your own batch of delicious, bubbly rosé with this DIY kit. 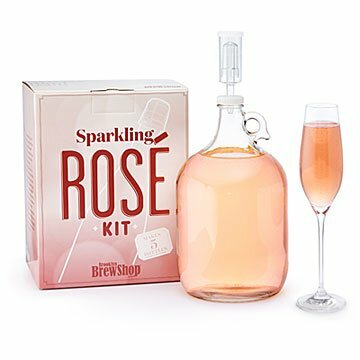 Mix the premium rosé grape juice and yeast in the gallon jug (all included), follow the instructions, and in six weeks' time you'll be ready to toast with your signature pink fizz. Fill up to five empty champagne bottles for your own future fêtes, or make them a fun surprise gift to a rosé-loving mom or girlfriend. Assembled in New York. Needed but not included: funnel and 5 bottles. Makes up to 5 bottles of sparkling rosé.